1MM MEDIA LTD – the publisher of the oldest Polish magazine in Great Britain, “Goniec Polski – The Polish Times”, and the website Goniec.com. Goniec Polski is a free weekly publication dedicated to Polish people living in Great Britain. During its twelve-year operation, the magazine has attracted a wide readership. The magazine is not just aimed at Poles who have settled in the UK, but also at British people with Polish roots. The latest edition of Goniec Polski is published every Friday, packed full of the most important information from Great Britain, Poland and the rest of the world. 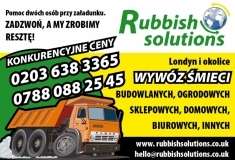 The magazine is distributed free of charge in about 500 points like: Polish shops, churches, cultural establishments, restaurants and the workplaces of Polish people in different parts of Great Britain. The weekly circulation is 40,000 copies. The magazine covers both issues directly linked to the life of Poles in Great Britain (information about work, the economy and politics), and general news from Poland, the UK and the rest of the world. Readers can also enjoy the features, the supplements and the permanent columns on: lifestyle, tourism, sports, health and beauty and entertainment. Goniec Polski is an excellent advertising platform for companies, brands and products which want to reach Polish speakers living in Great Britain.